Just like you, I have never heard of the Lisfranc injury before. I had no idea what a Lisfranc joint was or where it could be found in my body. Until very recently. Before I go on to tell you what I’ve been through in Nov-Dec (and later on later how my recovery has been), I have to apologise for the lack of content from me here at Miel and Mint and my social media. My injury silenced me in a very literal way. It made me scared. It made me sad. It made me quiet. I pretended for very long that what happened hasn’t affected me as much as it did. So many times I’d grab my phone to tweet about it or do an Insta story, and I’d stop. I didn’t want to sound too negative, bum people out or even give my injury a voice. I wanted to pretend like it never happened and jump right in with my usual “normal” content as soon as I’d feel better. But then 2 things happened: 1) I’ve experienced zero compassion from one person (thankfully, I quickly understood – it is not me, it’s them, they need to heal) and 2) many people told me that my experience could potentially help others who were or are going through a similar thing. I will be honest. I dismissed the first thing immediately. Yes, it hurt. It wasn’t nice. But I knew stone-cold people are people who are hurting. They need to take time and work on their own issues. I needed to move on and focus on my own healing. 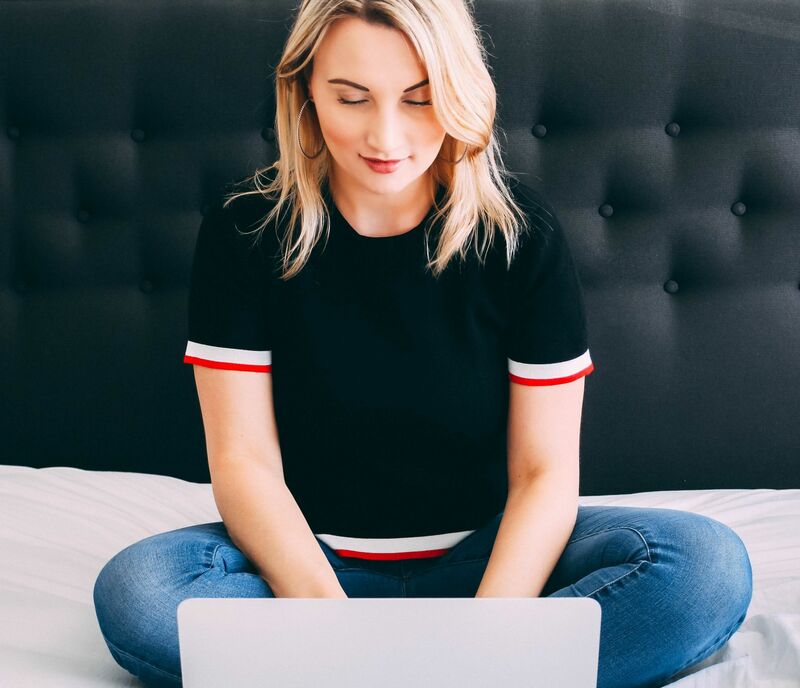 The second thing was my motivator to write this post. That, and also I am doing this for me too. I want to give my experience “a voice” and log it into my memory in order to learn from it instead of trying (and failing) to erase it. I want to free myself from the weight I’ve been carrying. I want to remind myself how strong I’ve grown to be through this whole thing. I have so many mixed emotions about it when I look back. It’s a no-brainer, I don’t like to remember it. Who would want to remember being hit by a car? I was crossing the road on a Tuesday evening on the 27th of November when it happened. Before you might think whether I looked both ways – yes, I did. I’ve always been very careful and cautious when I crossed the road, especially if it’s a busy road. This car came out of nowhere and everything happened both very quickly and in slow motion. I remember how my hands felt the body of this car but the actual contact happened so fast that my brain didn’t have time to register where I got hit at first. I fell and I knew I was in pain. I was crying and screaming. Mostly, because of the shock (and the pain – I’ve never felt pain like that in my life). I was also apologising. I just kept muttering “I’m sorry” through tears and agony. Many drivers stopped and passers-by ran to help me. I was very dizzy, I was passing out from pain and I couldn’t see people but I heard many voices. They carried me and put me onto the backseat of a car and one woman was sitting beside me and holding my hand. I remember I asked her to put it against my forehead as I felt so hot. Someone phoned the police and the ambulance. The police arrived first and the conversation I had with them was such a blur. I couldn’t even give the police officer my name. I was hyperventilating. My husband, who was at home at that time, was informed what had happened and was on his way to where I was. When they moved me on a wheelchair and wheeled me into the back of the ambulance car, that’s when things started to get a bit too real. At that stage I was in much more pain and my brain frantically started to analyse what had happened. It was surreal, almost like an inner scanner. My brain was trying to detect where I got hit and where I was hurting apart from the obvious. My foot. My foot was one thing where I knew I took the biggest hit. When the car hit me and I fell, I tried to jump up (adrenaline is a real thing!) and I almost did but my right foot gave in right away and I fell on the asphalt again. So that one was obvious. It felt like it was about to explode. It hurt to the point I was passing out from pain. My left hand and my thumb started throbbing too. I looked at it and it was huge and blue. Surprisingly, I understood I wasn’t hurt anywhere else. I closed my eyes and cried thanking God for preserving my life. Then it was back to the foot. 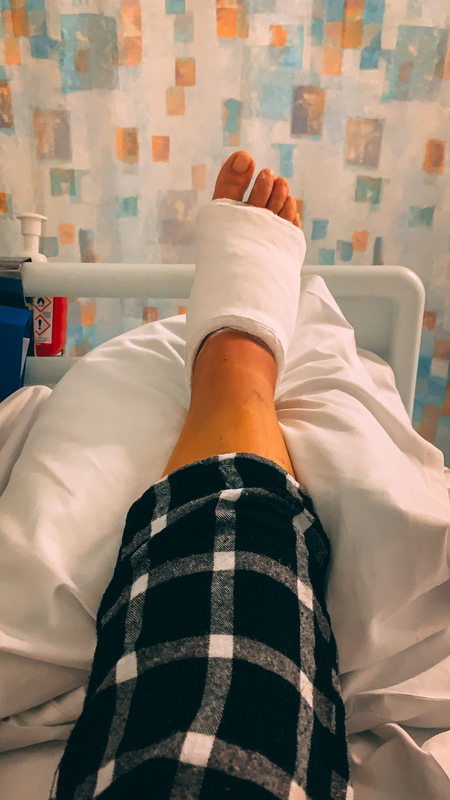 The reality kicked in – what is happening to my foot? Hundreds of questions started rushing through my mind: Is it really bad? Will I have my foot? Will I ever walk again? and many others of the same kind. The two paramedic guys who brought me inside the ambulance car started checking my vitals. One of them looked like Jonah Hill. I know, such a random thing to notice at such a time. They told me they were going to remove my boot. I was so scared. Scared to feel even more pain and scared to see my foot. I thought I’d see a mush of blood, meat and bones. “Jonah” connected a breathing mask to my mouth and asked me to take long inhalations. They also told me it’s okay if I start laughing because it’s normal with the gas. I had my boot removed and, oh joy, I saw my foot. It was very very swollen and huge (no wonder it felt like it was bursting out of my boot). There was no blood (thank goodness!) and it looked like my foot, only three times bigger. They checked whether oxygen was running through to my foot and toes and confirmed that it was. Meaning, things weren’t too bad. Though, I admit I did think at that stage that my bones could still be a mush. I remember asking them whether I’d walk (such a silly question since they had no idea what was happening inside my foot) and they shrugged. Then they cut through my jeans because I had a giant wet mark across my leg down from my knee. Both paramedics confirmed that most likely the car’s front wheel hit my leg and went over my foot. Yippee. Thankfully, no blood there either. Just a huge burn-like mark. It was brown-red and throbbing. My husband called me. I picked up and was struggling to put a sentence together. He told me to stay calm and said he’d be waiting for me at the A&E. He was so amazing. I was breathing in more of the “funny gas” but it wasn’t making me laugh at all. I was feeling nauseous and light-headed instead. They drove me to A&E where I saw my husband and our friends. The rest of the night was a blur of X-rays, tests and questionnaires. They let me out on the same night (about 5 or so hours later) with my left hand in a cast (broken wrist) and crutches. I had to keep icing and elevating my foot for the next week and a half to two weeks. The next day I got a call from the fracture clinic and they booked me in to see a specialist. Okay, just a little bit of history. Lisfranc injury (or Lisfranc fracture) is a mid-foot fracture-dislocation injury. It’s named after Jacques Lisfranc de St. Martin, a French surgeon. Back in his day people didn’t get better from this injury. Thankfully, today things are very different, right? It is the most uncommon and most severe injury one can sustain on their foot. It happens to 1 of 50,000-60,000 people annually. Yay to me for “scoring” such a unique injury. 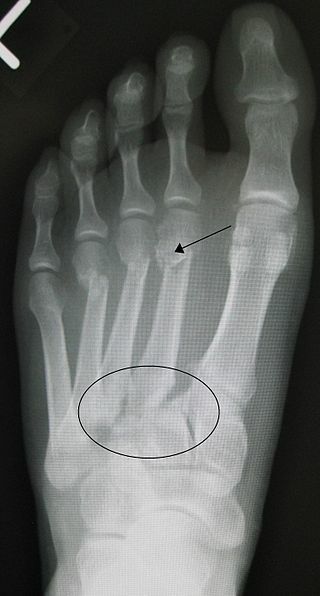 Lisfranc fracture is very common among athletes, especially those competing in such sports as windsurfing, wakeboarding, snowboarding and American football. My doctor told me he treated patients who got a Lisfranc injury when they fell from significant height (i.e., off the roof), and women are most likely to get it if they fall wearing high heels. One wrong step can change everything in a big way. I also found people online who suffered from a Lisfranc injury when they ran and tripped doing an obstacle course. A friend of mine had a Lisfranc injury 5 years ago after falling off the sledge and landing in an awkward way. So yes, while it’s very rare, it can happen while doing “normal” things. In my case it wasn’t very “normal”. A car drove over my foot. Not nice one bit. Okay, back to my story with this Lisfranc injury of mine. I must start from this little piece of advice: when it comes to injuries/fractures avoid taking advice from people who aren’t qualified to give advice. I tried to pressure myself into “walking” on my foot injuring myself even more. When I got to see a specialist at the orthopaedic clinic, I hadn’t been walking for 2 weeks at that stage. I tried to put my foot down (big mistake) but I couldn’t put any weight on it. The swelling did go down (icing was helping with that in a big way) but I still couldn’t walk. The surgeon took one look at my foot and said, ‘I suspect it is a Lisfranc injury’. Well, guess what. Imagine my surprise when my own self-diagnosis was confirmed. I know, it’s not good to Google your symptoms but one thing did stand out to me during those first 2 weeks. There was this really bad bruising on the bottom of my foot. My doctor looked at my giant bruise and confirmed my own Google findings. “Lucky” coincidence. He ordered an urgent CT scan because sometimes those fractures can be so subtle that an X-ray screening doesn’t pick it up. I remember that Friday evening like it was yesterday. It was 14 December. My husband drove me to the hospital for my 4:45pm CT scan. I was finished with it by 5pm. At 5:15pm I received a call from the orthopaedic clinic. They told me a Lisfranc injury was confirmed and a surgery was required. I’ve never had a surgery in my life. They explained to me that if I were an 80-year old they wouldn’t operate on the foot and let it “heal” on its own. Since I am a lot younger than that, a surgery is a must to bring my foot back to its original condition. They told me the surgery is scheduled for tomorrow. ‘Tomorrow???!!! !’ was my initial reaction. I got panicky. Now I am looking back and I am thankful that I didn’t have to wait for it and have more time to get myself even more worked up. I was told I couldn’t eat after midnight and that I should be ready to leave the house from 8am but to expect a phone call from a nurse. It’s safe to say I didn’t get much sleep that night. 15 December 9:30am. I was already at the hospital sitting on my bed in a ward. I remember telling my husband how much I wanted to be home already. I wanted the surgery to be over ASAP. Nurses came in and out, asked me many questions. I also got a cannula put into my arm. I couldn’t eat or drink at that stage and I was getting quite dizzy. Waiting was the worst part. Not knowing when they’d come to wheel me into the theatre. A theatre nurse came in and took my details one final time. She pulled out a black marker and confirmed with me that it was my right foot that will be operated on. They explained to me that I would be asleep during the whole thing and that I needed to make sure to stay nice and calm. Next moment they were getting me ready for the surgery. There were many people around me. I remember seeing at least 4 nurses, an anaesthesiologist and two surgeons. My surgeon, who is also the doctor who pre-diagnosed my Lisfranc injury, came up and said hello. He told me everything will be okay. He was to make 2 incisions and put it 2 plates to stabilise my foot (ORIF stands for Open Reduction Internal Fixation). Then, my anaesthesiologist started asking me questions about how the injury happened. All I remember is saying, ‘A car hit me as I was crossing the roooooooooooaaaaaaaaddddddddd….’. I was out. I woke up in the ACU recovery room. Well, I was slowly coming out of this daze. Everything was blurry but I soon started seeing shapes and medical staff around me. I was very dizzy but feeling okay. My foot was sore but not too sore. The surgery took about an hour and a half. It felt like just 2 seconds ago I was trying to tell my accident story. One nurse told me I have been talking just before I woke up. Apparently, I was telling them about penguins. Haha. So random. They gave me some water and after about 15 minutes wheeled me back into the ward. That’s when I looked at my foot for the first time after the operation. I also saw that the surgeon scraped off my giant hit/burn-like looking mark I had from the car wheel hitting my shin (not seen in the photo as it’s a bit higher). My leg from the knee down was numb. 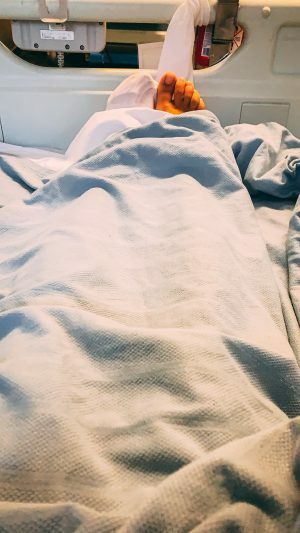 I was feeling fine when I was back in the ward, but since it was late’ish and I had to see my surgeon and a physiotherapist in the morning, I had no choice but to stay at the hospital overnight. 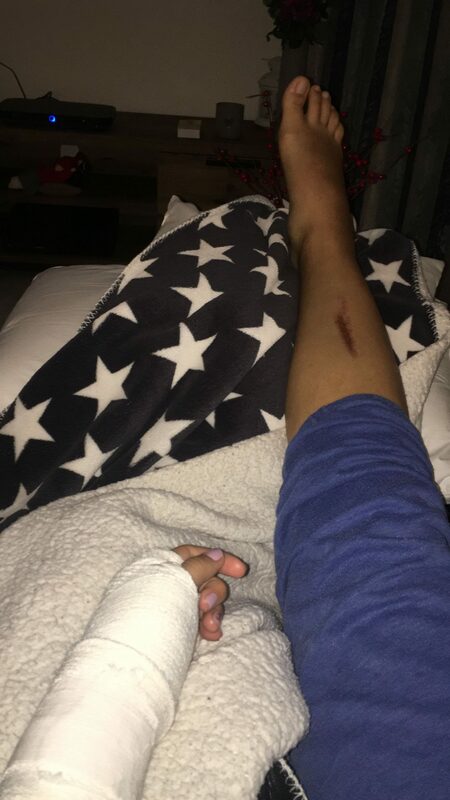 At first all I wanted is to get home but then the pain kicked in… and I was glad I was in the hospital. I was given my first dose of painkillers post-op. The nurse told me I would be taking paracetamol+codeine every 4 hours and Ibuprofen every 2 hours. Around 6pm they gave me Tramadol. I was in that much pain despite having taken three other painkillers. My husband went to get me water, juice and snacks for the night. Just as he was coming back into the ward I was sick. Not great. No Tramadol for me. That Saturday night, aka Night 1, I was popping painkillers like candy. I didn’t eat any food but I drank a lot of water. I also cried. I panicked a bit and I was in a lot of pain. I got so many messages from family and friends. I barely slept. I think I fell asleep around 2am but I’ve been woken up a lot because I was either in pain or heard other people screaming. My surgeon and two other consultants came to see me in the morning. He said I was all good for going home. Then the physiotherapist came and changed one of my crutches to support my broken wrist. I was told to try and get up and start walking. Well, hopping. On my left leg. I made it to the bathroom and back. Success! The pain was manageable in the morning but the situation changed in the afternoon. They were supposed to let me out around 3 or 4pm on that Sunday (16 December) but I knew it wouldn’t happen. Around 9:30pm the pain got so bad and so out of control (missed scheduled dose of painkillers due to a shift change) that I was crying rivers. By 10/10:30pm it got much much worse. A nurse rushed in and gave me paracetamol, codeine, ibuprofen and, when nothing worked, morphine. From 10:30pm to about 4:30am I was getting morphine every 2 hours as well as other painkillers alongside it. I am usually very good with pain. I can take a lot. But this was the kind of pain I couldn’t cope with. I prayed to God for a relief… and begged for the pain to stop. I could feel both of my incisions burning (it felt like they were being freshly cut – excuse the horrifying comparison) and I could feel the exact spots where the plates were put in. It was awful. This one nurse was coming up to see me to give me drugs every couple of hours. Around 1 or 2am she came up and saw me crying. She gave me a cuddle and told me she’d bring another dose of morphine soon. I managed to fall asleep by 5ish in the morning and was woken up around 6 by the granny who was in a bed opposite me. She was shouting for a toilet. That morning I was so incredibly thankful for all the help I got that night from the nurses and for the fact that I was asked to stay overnight. Another nurse, who has actually been following me on Instagram (what a small world! ), came up to me and advised I’d stay at the hospital for one more night because of the pain I was in. I was to see the pain specialist that afternoon as well. Monday night, or Night 3, was bad but not as bad as Night 2. On Tuesday (18 December) I was monitored until about 3pm and was allowed to go home with a giant bag of “goodies” which included 55 injections and at least 8 packs of painkillers. I was so dizzy and was very close to being sick in the car on our way home. When I hopped inside, I made it to the sofa, smiled at my husband, told him how happy I was to be at home and closed my eyes. I slept for 3 hours straight without waking up. Then I woke up, changed into fresh PJs and fell asleep on the sofa again. It was to become “my bed” for a while. It’s unreal to see how far I’ve come since that day. Things are definitely progressing and I am getting better. There’s still good bit to go but I am on the mend. When I came home after my Lisfranc surgery I was desperately looking for people who’ve been through the same. 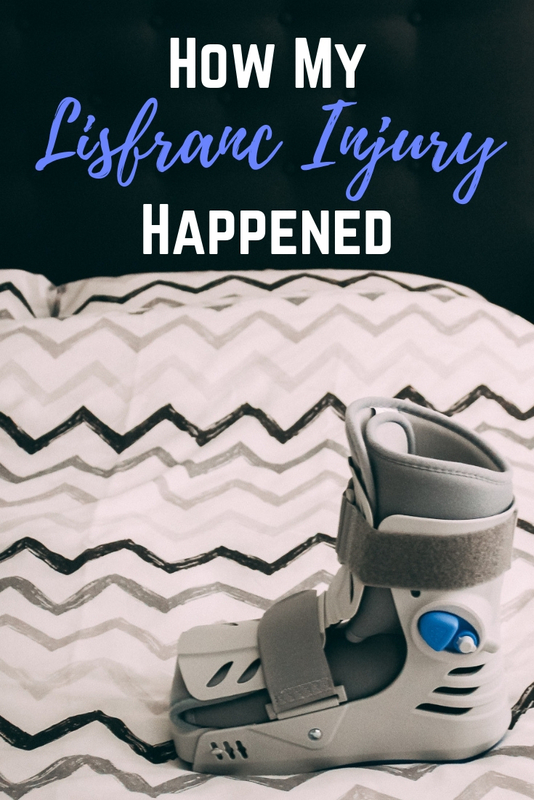 I found a few blog posts dedicated to the Lisfranc injury but most of them were quite depressing. Those were either stories of people who had the worst and the longest of recoveries or people who haven’t had a surgery. 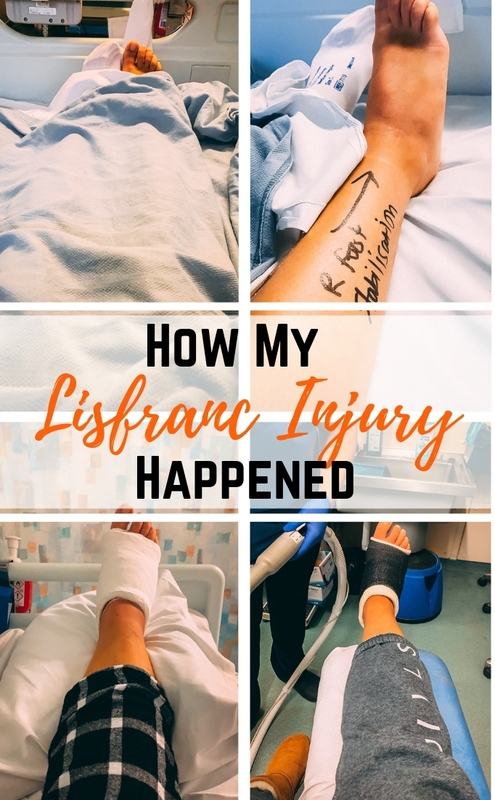 That’s why I thought it would be a good idea to share one more blog post about my Lisfranc injury journey. This time it will be a recovery story. I want to let you in on what I’ve gone through from mid-December to now (almost mid-February). 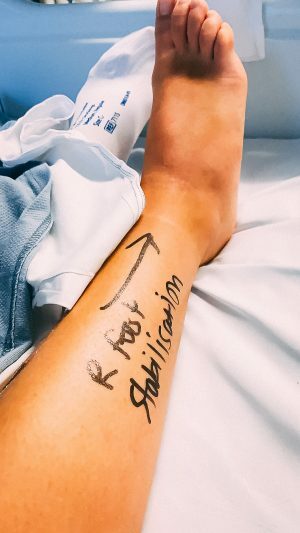 I also hope that maybe someone who’s just been diagnosed with a Lisfranc injury will come across these posts and, hopefully, find them helpful and encouraging. I am doing great and I am improving daily, despite the struggles and the limitations that come with this injury. I am healing and growing in strength – all credit for that goes to God. I am thankful for surviving that car accident and thankful for what this injury has taught me in the past 2+ months. Part 2 ‘The Recovery’ is coming up shortly. Let me know if you’d like to read about what my life’s been like post-surgery. I am so grateful to so many of you who have been sending me messages/well wishes and checking in on me many times.